Next up on the Pregnancy Super Foods list is the rather vague category of “Colorful Fruits and Vegetables”. This covers everything from blueberries to red bell pepper, and at first I was stumped when trying to think of a recipe that would cover this item. First of all, that is a lot of variety to try and fit into one recipe. Also, there is the regrettable fact that, for half of my pregnancy anyway, the thought of eating vegetables makes me slightly sick. Then I happened to notice that the most visited post, out of all the 100+ posts on this blog, is still my Rainbow Fruit Platter. I meant this platter to be a fun way to encourage children to eat fruit, but it seems that adults find the concept appealing too. Why not then, I wondered to myself, make a rainbow vegetable platter? 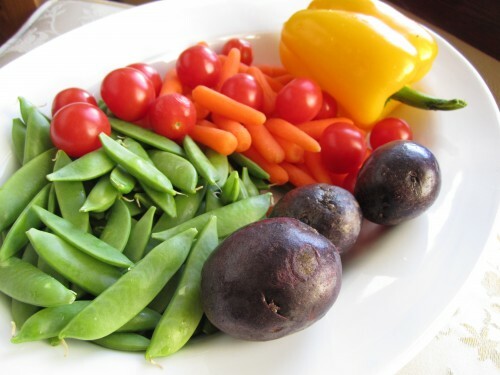 Many articles I have read indicate that eating a range of different colored vegetables is the surest way to make sure one is getting a healthy dose of vitamins. So, why not stick a bunch of different colored vegetables on one, big appetizing platter? Just add a couple of flavorful, low-fat dips and you’re set! That was the plan anyway, until I tried to think of vegetables to fit the whole spectrum of the rainbow, which turned out to be trickier than choosing colorful fruits. However, with a lot of brainstorming, and the help of my extremely creative sister, I finally came up with a list of vegetables to fit each color in the rainbow. Purple was the hardest color to match, but we finally figured out a few ideas. I set out this platter of rainbow vegetables as an appetizer at a recent dinner party and we devoured the entire thing in no time. Our preschool aged kids were even interested enough to eat handfuls of carrots, cherry tomatoes and sugar snap peas! I think there is something attractive about this colorful display that makes vegetables more appetizing to everyone. 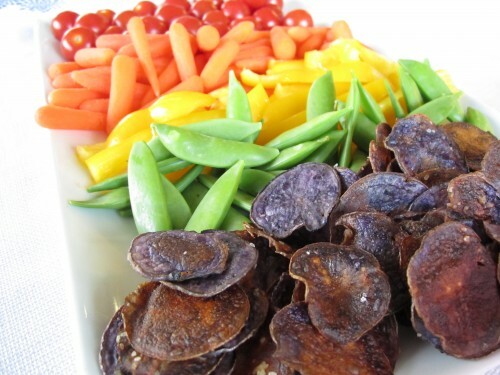 See our list of colorful vegetables ideas below, along with recipes for two delicious dips. Please leave a comment if you think of any additional vegetables to fit the color categories I have listed; I need lots of help on this one! Also, check out these other colorful, yummy recipes for your daily dose of veggies: Baked veggie egg rolls, Quinoa Stuffed Chiles, Dill Glazed Carrots, Kale Coleslaw, Radish and Sugar Snap Pea Salad, or Lemon Herb Tortellini with Veggies. Green: Lots of choices here! Snow peas, sugar snap peas, green bell pepper strips, steamed broccoli, edamame, celery sticks, etc. 1. Preheat the oven to 425 F. Toss the thinly sliced potatoes with the olive oil and spread them out in a single layer on a large sheet pan. Sprinkle lightly with kosher salt. 2. Cook potatoes in the preheated oven until lightly browned and crispy, about 10 minutes. Check often to prevent burning. 3. Remove the chips from the pan with a metal spatula and serve immediately while still hot and crispy! 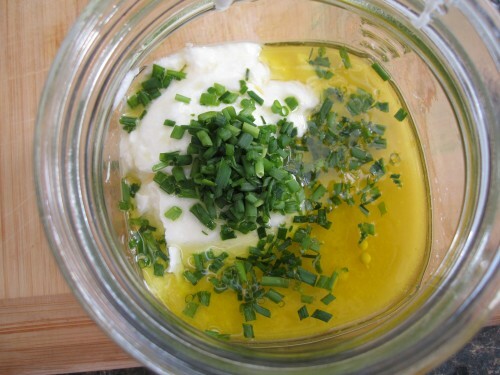 I think this dip would also be great with dill, parsley or thyme in place of the chives, but I haven’t tried out these variations yet. 1. 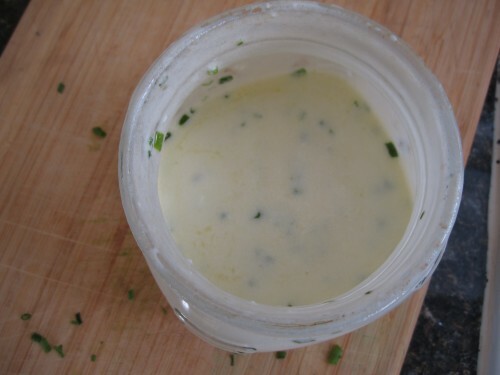 Place all the ingredients in a small jar, screw the lid on tightly and shake until well-combined. Chill until ready to use. Keeps in the fridge for up to 1 week.